Tuesday’s, I find are an easy day to wake up and be awesome. Primarily because I have a morning yin/yang yoga class. First, that is fun to say, yin/yang yoga. I love alliteration. It appeals to my appreciation of rhythm and poetry. But, back to Tuesday and waking up awesome. 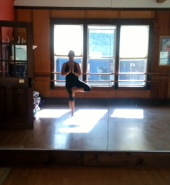 I am lucky to have a yoga studio across the street from my home. Provemont Community Center is a ‘gathering place for wellness and fitness’ and host to the Tuesday morning yin/yang yoga class lead by, instructor Michelle Bordeaux. She guides us through a meditative practice of holding poses to really allow deep stretching and relaxation of the muscles and then into a gentle flow of poses that heat the body up. It is relaxing, restorative and energizing all in one. I love it! I often wish I could start each day with this class. I am supposed to be practicing on my own. I intend to practice, each day on my own. The trouble is, my daily practice often turns into a nap. I mean I am laying on the ground, hugging my knees and rocking and stretching and then there is the bit in between the stretching and rocking were I lay still, palms open, legs stretched out. It is called, Shavasana, or The Corpse Pose or as I like to think, Nap Time. At least, when I am home and not prompted to move into another position. Shavasana feels really good and some times I linger and that is where practice becomes snoozing. Thankfully the word ‘practice’ reminds me that I am working towards something, again to be a beginner, learning, not a master but a student. I start out simply with the intention to remain awake during my at home practice and then to be ok if I really just need to rest. And when Tuesday comes around, I am so happy to be led through the work and Be Awake. Thank you, Michelle, your class is a lovely space in my week.